Reddy Construction has a long history of site development and earthwork in Rochester, NY and the surrounding area. 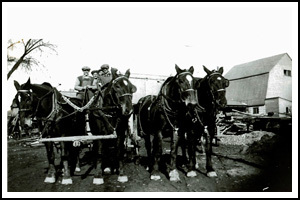 Our grandfather, bought his first slip-scraper and team of horses in the 1930’s. Since then, our family has worked on residential, commercial, and municipal projects, moving earth, installing water mains, storm sewers and sanitary sewers, and building roads and sidewalks. We grew up playing at construction sites! As teenagers, we helped out – on the sites, in the shop, and even in the office.